The oldest museum in Romagna, established in 1796, where “there is the story of a city that has been an artistic capital ”*. A story illustrated by 200 works of art, from the 1200 painted Cross to Donatello and the Renaissance masterpieces, to the paintings of the great Italian twentieth century by De Chirico, Savinio and Morandi. A museum that has been renovated with free wi-fi in all the rooms, the app and the qr-code with the multimedia audio guide. Monograph in the series of the museum system of the Province of Ravenna. To get to know the Municipal Art Gallery of Faenza, its history and its collections. A city, Faenza, that changes appearance in a generation [at the end of the eighteenth century] and sees architects such as Giuseppe Pistocchi, like Giovanni Antonio Antolini, artists like Felice Giani and Antonio Trentanove realize the most extraordinary fusion of architecture, sculpture, painting and applied arts as never seen before and never again will be seen under the sky of Italy *. ringing the bell of Via S. Maria dell’Angelo 5 or calling phone number (+39) 0546 680251. – First saturday and sunday of every month. 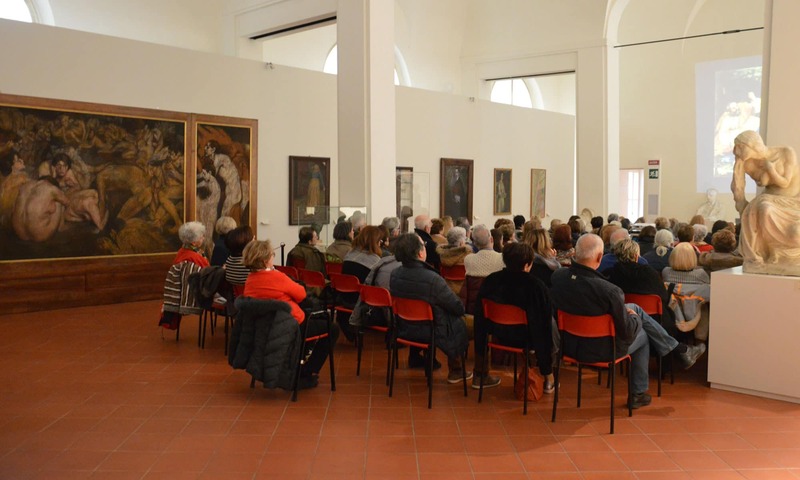 – Everyone under 16, students of schools in Faenza, tour operator, journalists, portatori di handicap, ICOM (International Council of Museums) members, possessors of Romagna Visit Card, other categories indicated by current regulations. Via S.Maria dell’Angelo 9, 48018 Faenza. From Piazza Battisti go along Viale A.Baccarini, Corso A. Baccarini, cross Corso Mazzini, take the first stretch of Via Cavour and turn the first street on the left. It is Via S. Maria dell’Angelo and at n. 9 immediately after the church of S. Maria dell’Angelo there is the entrance to the Pinacoteca. After the railway bridge you will arrive in Piazzale Sercognani, turn right into Viale IV Novembre, at the traffic light turn left onto Avenue A. Baccarini, reach the end of Viale Baccarini is a barrier to the car that you can overcome turning left for Corso Mazzini up to Piazza II June use Piazza II Giugno as a roundabout and return to Corso Mazzini in the opposite direction to the previous one. Once you reach the barrier, turn right onto Via Cavour, after less than a hundred meters on the left there is a parking lot. Park the car, exit the parking lot on via S. Maria dell’Angelo and left at no. 9 immediately after the church of S. Maria dell’Angelo there is the entrance to the Pinacoteca. 10100 – Entrance Hall – Sculpture in Faenza in the early decades of the twentieth century. In the entrance hall there are sculptures of Domenico Baccarini (1882-1907), Ercole Drei (1886-1973), Domenico Rambelli (1886-1972), Angelo Biancini (1911-1988) and also two works of Auguste Rodin. 10010 – Bianchedi Bettoli / Vallunga collection – Collection of works by the greatest artists of the twentieth century Italian. The donation received in the Pinacoteca in 2010 thanks to the wills of Augusto Vallunga contains important works of 20th century Italian art, from De Chirico to Morandi, with Savinio, Severini, De Pisis, Carrà, Campigli and Gentilini. 10200 – Still life – Eighteenth-century still life. In the hall there are two beautiful works by Carlo Magini (Fano 1720 – 1806) the Sleeping Dog by Arcangelo Resani (1670-1740) and other works by Felice Boselli, by the neapolitans Giovanni Battista Ruoppolo (1629-1693) and Giuseppe Recco (1634- 1695) and of the Venetian Francesco Guardi. 10300 – Marco Palmezzano – Passage room with four tables by the master from Romagna Marco Palmezzano. 10500 – Sala Bertucci il Vecchio – Room dedicated to Giovanni Battista Bertucci the Elder. About the painter from Faenza we have information from 1495 to 1516 and was the founder of a family of painters that lasted three generations throughout the 16th century. 10400 – Manfredi Hall – Historical works and relics dating back to the period of the Manfredi family, Lords of Faenza from 1300 to the end of the 15th century. 10600 – Donatello Hall – The masterpieces of the Faenza artistic Renaissance. The San Girolamo by Donatello is at the center, on the walls the table of the master of the Bertoni Altar Piece, three works by Biagio d’Antonio, the Romagna’s masterpiece by Palmezzano and the altarpiece by Bertucci dated 1506. 10700 – Vestibule – A room full of surprises: from the Byzantine-Ravenna works, to the Gothic and late Gothic with real masterpieces of the fourteenth century and on one wall the large group in patinated terracotta byAlfonso Lombardi (1487-1537). In the list of the works in this room the thirteenth-century crucifix, the table by Giovanni da Rimini, important works of late-gothic culture of the fifteenth century, the table by Giovanni da Rimini and the Venetian papier-mâché with Christ in piety. 10800 – Magistrate Hall – At the center of 17th century painting there is the mysterious and fascinating portrait of Magistrato, with works by the Bolognese school, portraits and postmanierist and Caravaggesque paintings. 10900 –Altarpieces Hall –The large hall with the original nineteenth-century arrangement of altarpieces painted in the sixteenth and early seventeenth century. The first sixteenth century is well represented by two paddles by Sigismondo Foschi and follow works by Jacopone Bertucci, Luca Scaletti, Marco Marchetti and Nicolò Paganelli. Four very important works are presented by Ferraù Fenzoni and for the seventeenth century the “caravaggesco di periferia” Biagio Manzoni should not be missed. Two large canvases by Alessandro Tiarini close the historical-artistic path of this hall.